The first counterbalance truck to be spelled with three E's - lower energy consumption, excellent ergonomics and higher handling efficiency - is also available with four wheels. The TX4's new design makes it the perfect four-wheeled counterbalance for you. No matter your operation, the TX series offers unbeatable energy efficiency. The new TX3, for example, is the best in its class for energy consumption, offering rates as low as 4.2 kWh/h. This means the truck will keep going on a single charge for longer than any of its competitors, and this kind of high efficiency is also present in the TX4. Like all of UniCarriers' trucks, the TX4 has been designed with ergonomics in mind. The truck's quiet operation makes long shifts easier to handle, and the ProVision design concept means the driver gets excellent visibility in all directions, whether they're lifting heavy pallets or travelling around the warehouse. The TX4 is available in different models, offering maximum lift capacities from 1.25 to 2 tonnes, and a lift height of up to 7 metres - so whatever you need it for, there should be a TX4 for you. The truck's ergonomic controls, wide floor and low entry/exit steps also help make the TX4 a pleasure to operate, and allows drivers to be more productive during a shift. The truck's design helps boost handling efficiency, too. This factor is about more than just performance - ergonomics, visibility and operability also play a major role. Drivers who are assisted by the truck's industry-leading safety performance systems will increase productivity and reduce handling costs. Overall, the new TX4 is a truly modern four-wheel counterbalance. As you would expect from UniCarriers, its reliability and performance are seriously impressive - but it also has the technology and extra features to make owning and driving it as easy as possible. Are you interested in the UniCarriers TX4? Want to know more? Our new TX trucks have the lowest energy consumption in their class. The 1.6-ton TX3, for example, consumes only 4.2kWh/h, making it the most efficient vehicle in this weight class. What does this mean for you? Simply, the new TX will operate for longer on a single charge than any other similar truck currently on the market - making your operation more efficient, productive and profitable. One of the most important parts of ergonomic design is to ensure the operator's wellbeing. Our new TX trucks are designied to make no compromises in the pursuit of this goal. For example, the TX trucks have the quietest hydraulics in their class, as well as unique hydraulic levers for intuitive, comfortable operation. Ergonomics isn't just something which is 'nice to have' - it can really boost efficiency and your bottom line. By bringing a truly ergonomic counterbalance like the TX into your operation, you'll quickly see the effects. The new TX offers unique handling efficiency thanks to a number of best-in-class features. All aspects of the truck's movement speed - in lifting, tilting and driving - are automatically optimised based on load, lift height and tilt angle. It gives the driver peace of mind, and lets them focus on efficiency. 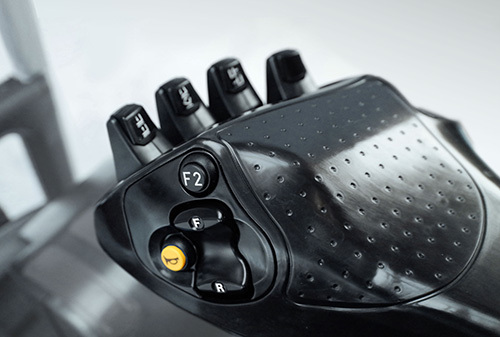 Force feedback via the steering wheel further provides an intuitive driving experience. The ProVision concept unites to give a great view all around the truck, especially through the mast - which offers best-in-class visibility. Small details like the grip on the fingertip controls, industry-leading low entry/exit step and a fully automatic anti-rollback parking brake make the new TX an incredibly easy and efficient truck to drive.